Enjoy a day of epic Paris sightseeing with an awesome saver combo! Enjoy a day of epic Paris sightseeing with a 1-day Paris Open Tour hop-on, hop-off pass, covering more than 30 stops across 3 different routes. Hop on and off the bus at any of the designated stops to start exploring the charming city of Paris. Explore the captivating French capital from the open-top upper deck of the bus. This hop-on, hop-off tour allows you to organise your own sightseeing itinerary, exploring your chosen top attractions of the city when it suits you. Choose from a number of interconnecting routes and listen to audio-commentary to learn more about the Paris attractions as you pass them. Notre Dame and the Heart of Paris Tour: Visit the gothic cathedral and learn about its unique architecture and explore the medieval back-streets behind Notre Dame, where ordinary tourists don’t go. The tour operates daily at 1pm. Meet your guide (look for pink vest!) outside Notre Dame by the Horse statue. The Highlights of Paris: See the major Paris attractions including the Champs Elysées, the Louvre Museum, Arc de Triomphe, and the Eiffel tower in the introductory walking tour of the city. The tour operates daily at 1:30pm. Meet your guide (look for pink vest!) outside Opera Garnier, on the steps facing a venue de l’opéra. Skip the lines and see some of the greatest art pieces in the world, including the Venus de Milo, the Victory of Samothrace and Leonardo da Vinci's Mona Lisa, painted at the beginning of the 16th century at the Louvre Museum. Since the success of Dan Brown's The Da Vinci Code, the Louvre museum has become an even bigger tourist magnet. Get a taste of French culture and European art history on a tour of the iconic art gallery. Listen to recorded commentaries about the museum’s greatest works and spend time studying some of the greatest masterpieces in the world of art. The Paris Hop-On Hop-Off Tour: Timings change as per the season. Louvre Museum: 10am. You must visit the attraction on the date selected by you for the booking. 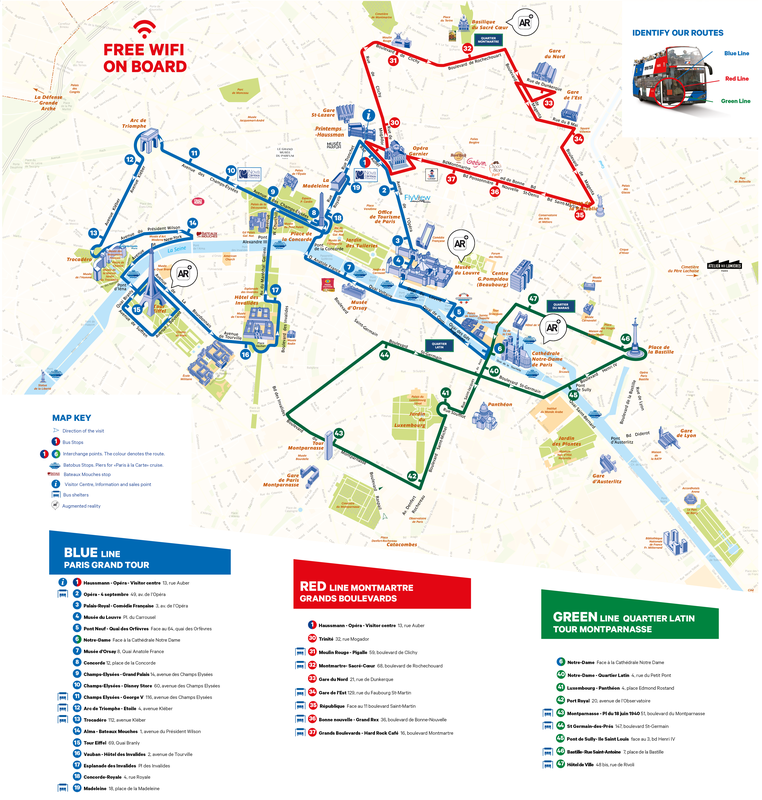 Please exchange your voucher for the hop-on, hop-off pass and Louvre Museum ticket at the local operator's office located at 2 rue des Pyramides, Paris 75001. Louvre Museum: Make your own way to the museum entrance. The date and schedule you select at the time of booking represents the date you will pick up the tickets and depart for the Louvre. Louvre Audio guide: A deposit of 32 euros per audioguide will be required at the agency upon departure. You will have to return the audio-guide at the end of the tour and the deposit will be returned to you. There is a cloakroom available for large bags, buggies and umbrellas. The Louvre Museum closes at 10pm on Wednesday and Friday and at 6pm on other open days. So there’s no last-minute rush please arrive 30 minutes before the departure with a printed copy of the voucher. The tour departs from the local operator’s office at 2 rue des Pyramides, Paris 75001. Bus tour was great, but the weather was very cold in Paris so you needed to dress up warm if you wanted to go top deck! The Louvre museum was marvellous, but you still had to queue to get in the front entrance, which was around 45 minutes, then when you get inside, you had to then show your ticket. The weather wasn't good either as you're queuing outside with no cover, so take a brolly! Very busy in the Louvre too.